Four Wheel Walkers or Rollators differ from the tri wheel walkers in that they have 4 wheels instead of 3. Generally the two front castors will swivel to enable the frame to turn, whilst the rear two are fixed for stability. our wheel walkers usually incorporate a seat between the handle bars which can be extremely useful if you need to rest during your journey. 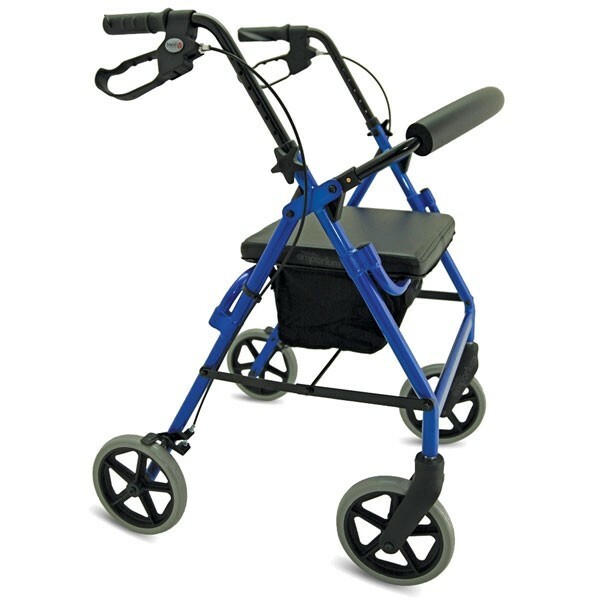 Four wheel walkers tend to be wider and less maneuverable than tri wheel walkers but provide greater stability and are less likely to tip over. Weighs only 7.5kgs (16.5lbs) including the bag. Adjustable Seat height.